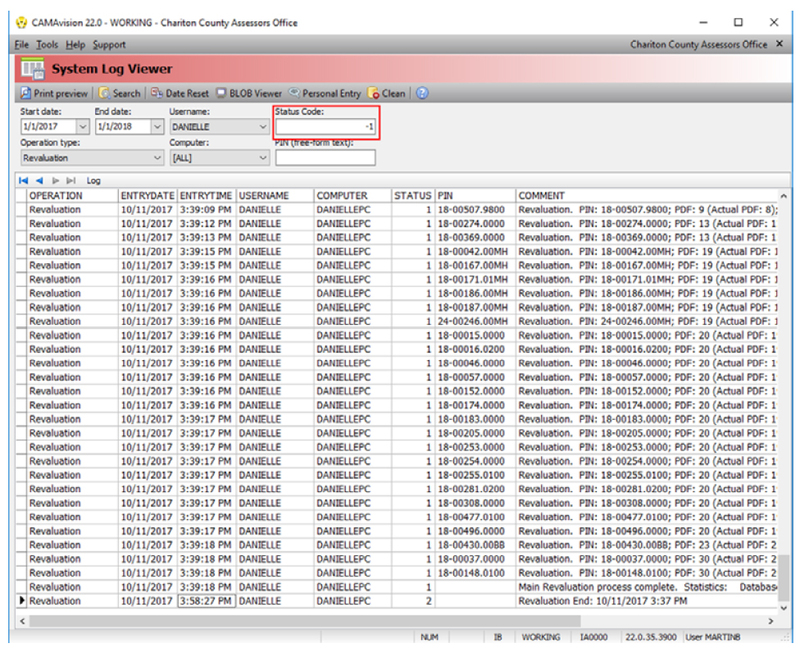 The System Log Viewer – Vanguard Appraisals, Inc.
CAMAvision keeps track of our batch processes that have been ran. Sometimes it can be very useful to look back and see what was run and when. We can see when tables were copied, when revaluations were done, even when parcels were certified. We can also see who ran those processes and which parcels were affected. See below for some examples of how to ran them. Pick date range: Start by picking a date range for the process you’re in search of. 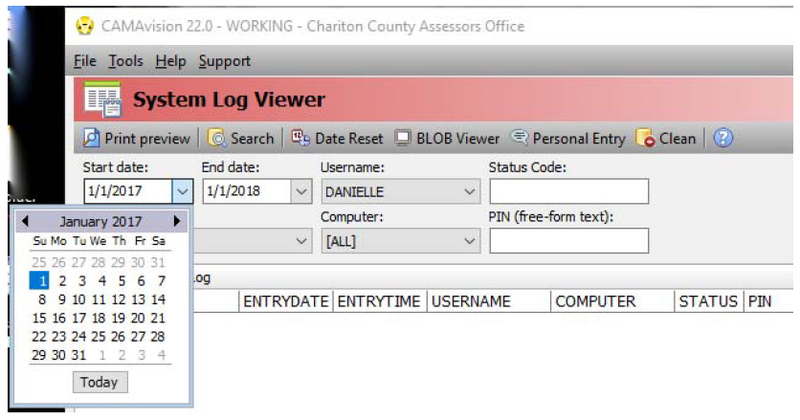 If you’re not sure exactly when the process was ran you can pick a broad date range. Operation Type: Pick the type of batch process you’re in search of. In this example, we’ll look for a Revaluation. 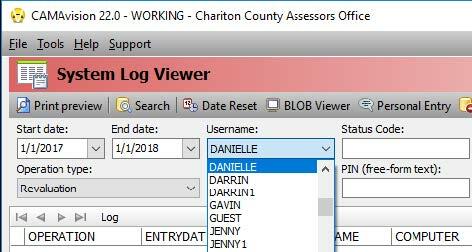 User: If you know who ran the process you can pick their username. Status Codes: The status codes identify which part of the process the line is representing. 0: Code zero means the beginning of the process. 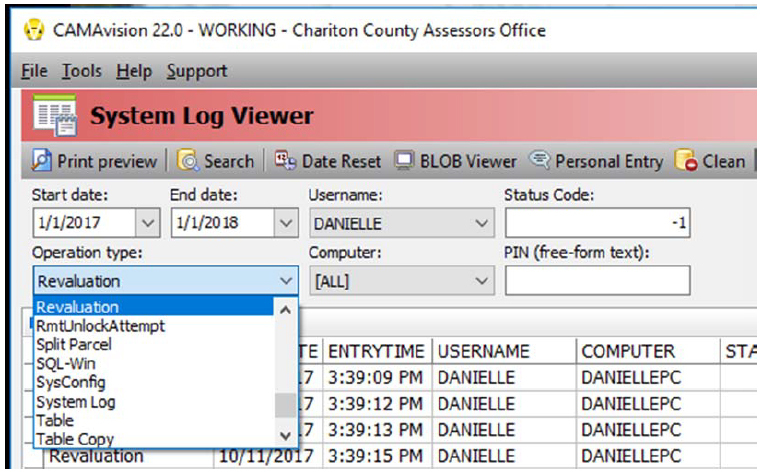 You can specifically look for code 0’s to quickly look for all instances . 1: Code one is where the work is getting done. In many processes, like the Revaluation Batch, each parcel affected by the process will have its own line for status code 1. 2: Code two means the process completed. If there is an instance of a status 0 without a corresponding status 2, then there may have been an issue while running the process. -1: To see ALL status codes, put -1 or blank in the status code field.